I love the look of gavi's Spherical lattice on Thingiverse, but don't have a resin printer to get the beautiful print that they do. 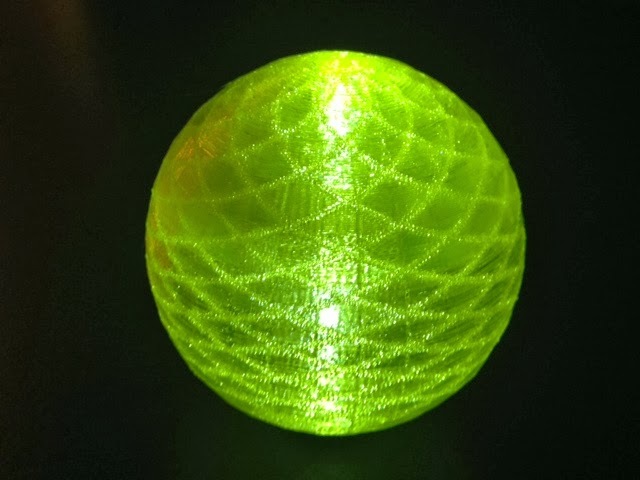 However, their low-res "visualization only" file is small enough to open in Tinkercad, so I sandwiched it between two spherical layers and printed in translucent filament as an LED light cover, for a small table glow lamp. Settings: MakerWare "low" with raft but no supports, in 2 hours and 46 minutes. Technical notes: You can think of this "sandwich" as building your own custom infill for the sphere. It worked better than putting the design on the inside or outside, both of which had printing issues. The model is built to fit around a twist-on battery LED assembly I found on amazon.com. You could use your own LED + 2 2032 batteries but it is relatively economical to buy them pre-assembled like this.